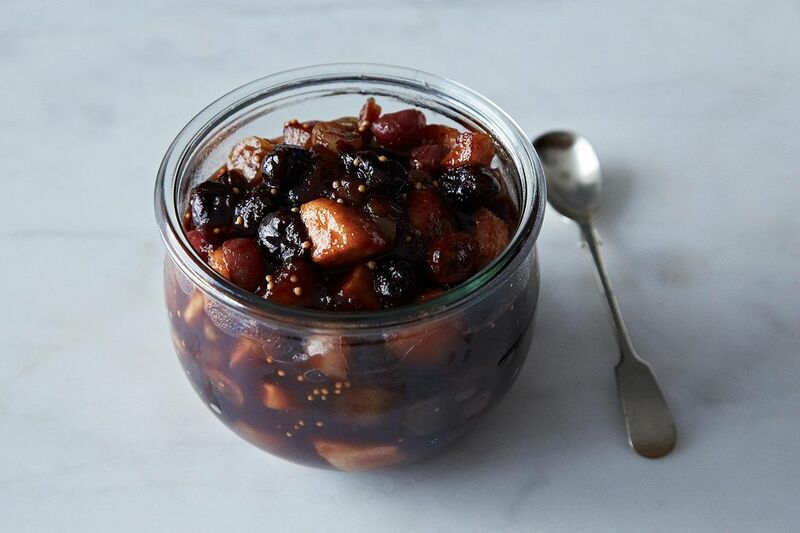 Do a quick search for “mostarda” on the internet, and you’ll find quite a few recipes that involve cooking up, and serving shortly thereafter, a sweet and savory condiment indistinguishable from what most Americans would call a chutney. Don’t get me wrong; I have nothing against chutneys. (I put up several dozen jars of them every summer.) A true mostarda, however, requires more time -- at least several days -- to pull the sweet juices from the fruit, and then to reduce them to a thick, flavorful syrup. The active time spent making mostarda, however, shouldn’t require more than an hour, all told. Use fresh fruit, or a combination of fresh and dried. In the fall, I almost always use at least one apple or pear, and often both, adding a few dried figs or cherries. This combination goes well with the roasts and cheese plates we serve in the fall and winter. (The original mostardas, from northern Italy, have for centuries been served with the combination of boiled meats known as bollito misto.) During the summer, I combine cherries with nectarines or peaches for a mostarda that goes perfectly with grilled chicken, sausages, and pork chops. 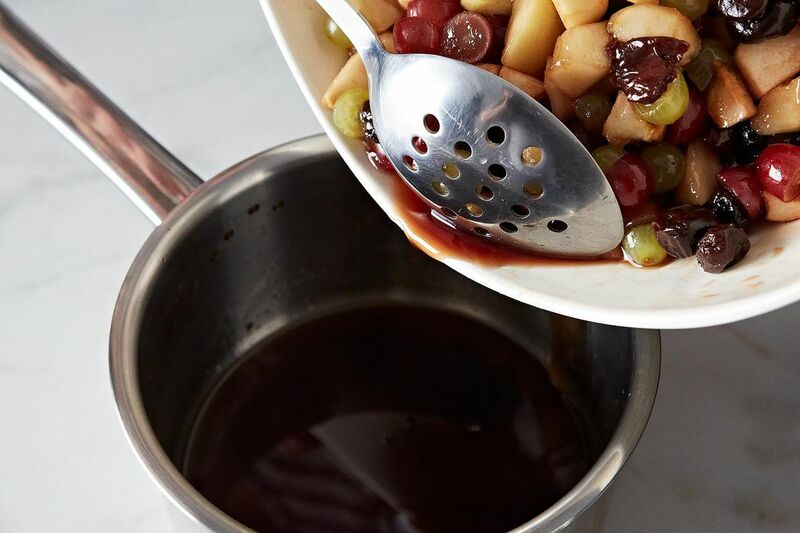 In the cooler months, you can also use grapes, quince, Asian pears, and citrus, including candied citrus peel. 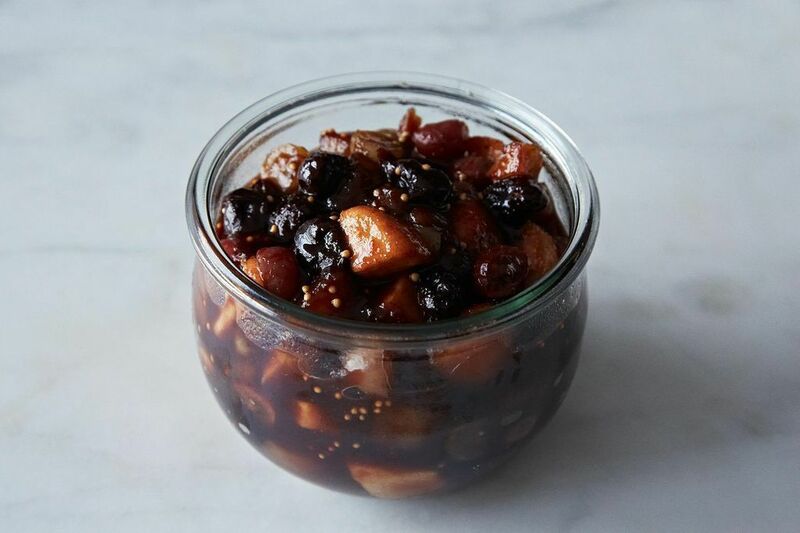 This is a great way to use up odd bits of any dried fruit in your pantry. At a minimum, you’ll need fruit, sugar, dry mustard powder (I like Oaktown Spice Shop’s, but Colman’s is also a great choice, if you can find it) and a splash of wine or vinegar, or both. More: Get AntoniaJames' favorite mustard seed combo in Provisions; make the finest mostarda on the block. 1. 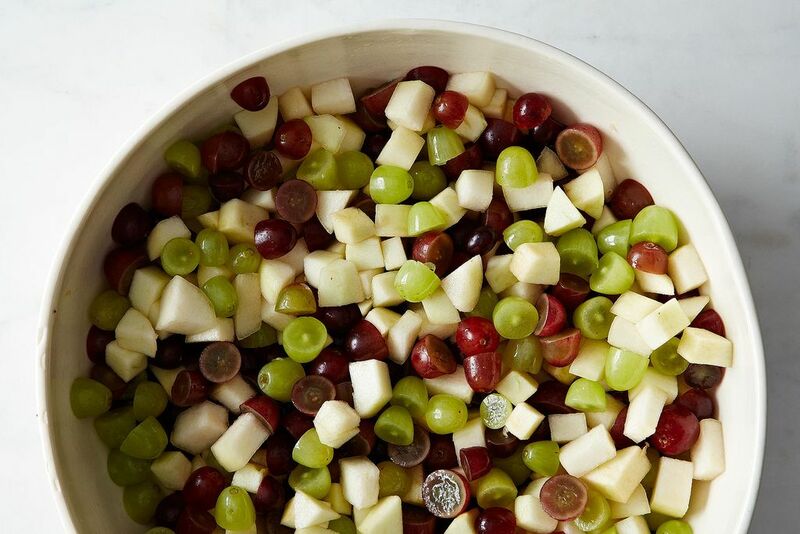 On Day 1, peel and cut the fresh fruit into small chunks (pictured below: apples, pears, and grapes). Put it into a wide non-reactive bowl. For each pound of prepared fruit, sprinkle on 1/3 to 1/2 cup of sugar, depending on the fruit’s sweetness. Tart varieties of apple tend not to release much liquid, so select softer, sweeter varieties for this. 2. Cut larger dried fruits in half or quarters. Put all the dried fruit in a non-reactive pan, and cover, just barely, with water or a sweet white wine (pictured below: dried cherries). 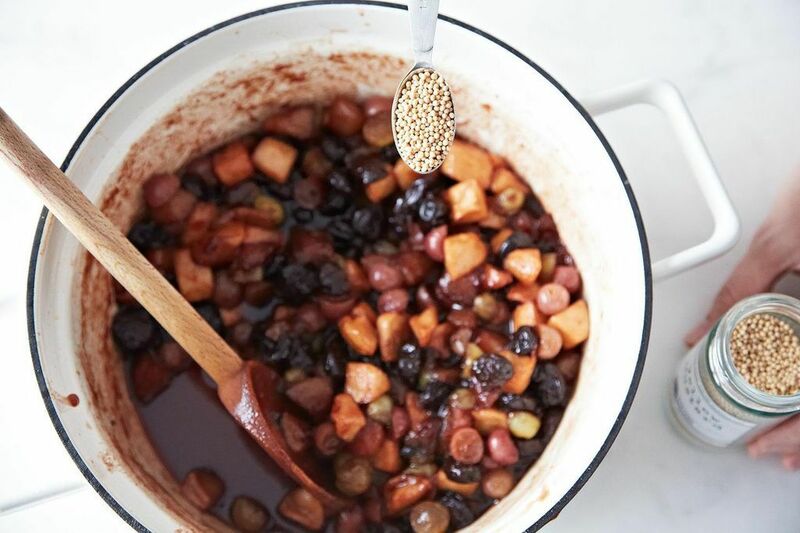 Simmer for 10 to 15 minutes; cool and pour over the fresh fruit and sugar. Gently stir the contents of the bowl to coat. Cover and let sit for a few hours. Gently transfer to a glass or plastic box, scraping any sugar off the bottom of the bowl. Cover tightly, and refrigerate overnight. 3. On Day 2 -- ideally, 24 hours later -- pour off the syrup into a small non-reactive saucepan. If you want to add spices in addition to the mustard, which you’ll stir in at the very end, put them in a cheesecloth bag or tea ball and drop into the syrup. Add some slivers of fresh ginger or candied citrus peel, if that strikes your fancy. 4. 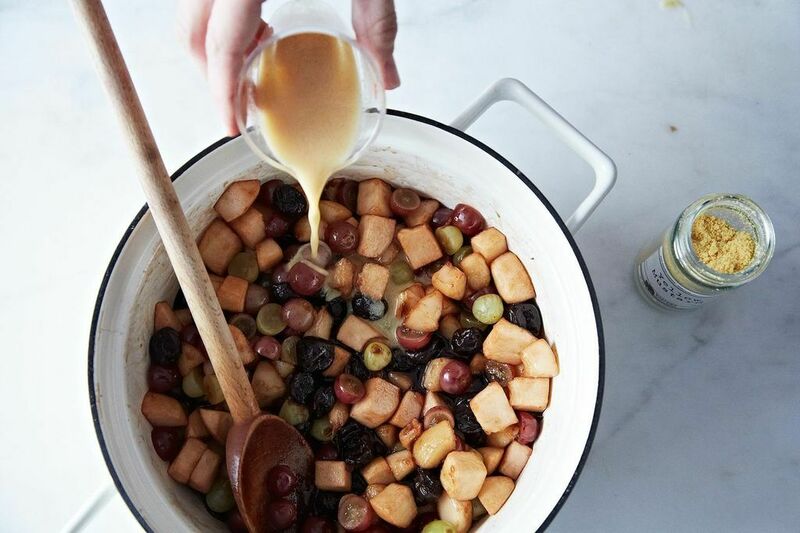 Over medium-low heat, reduce the syrup to a thick syrup; pour it over the fruit, gently stirring to coat it. Cover and let it stand for a few hours. Then, refrigerate for another 24 hours or more. On Day 3, pour off and reduce the syrup as you did on Day 2. You can now either finish the mostarda, or let it rest another 24 or 48 hours, reducing the syrup each day. 5. To finish the mostarda, reduce the syrup until quite thick over medium-low heat. Add the fruit to the pan and simmer it gently. 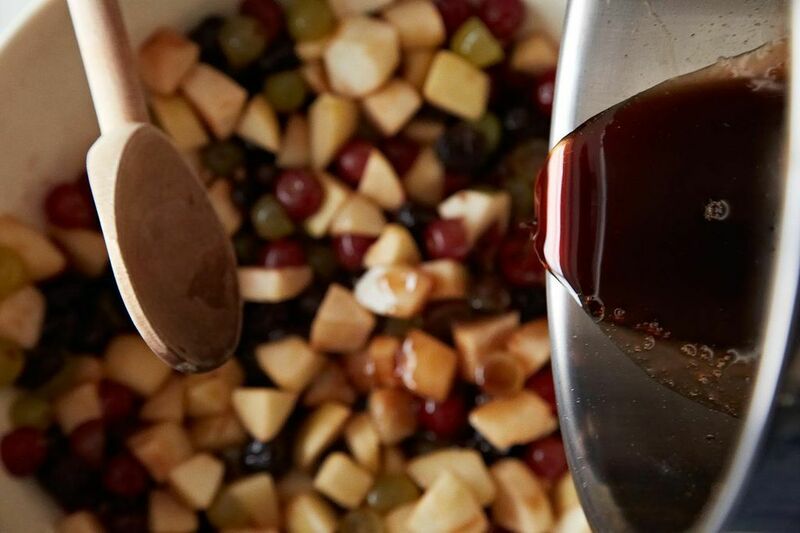 For each 4 cups of cooked fruit, mix 1 to 2 tablespoons of ground mustard with twice that amount of wine vinegar or cider vinegar, or a combination of vinegar and white wine. 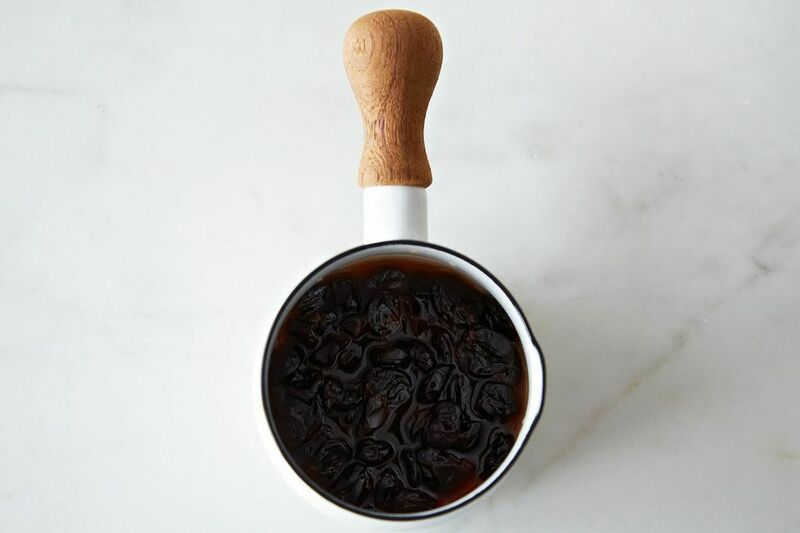 Pour that into the pan. 6. Simmer gently for 10 minutes, stirring occasionally. Taste, and add more vinegar or wine, if you like, and reduce again. For a bit more bite, add 1 to 2 teaspoons of yellow mustard seeds. 7. Let the mostarda cool, covered, on the counter. Put it into a sterilized jar and store tightly covered in the refrigerator. It will hold for at least a month. Enjoy! Hi, I'm making this now, on day three and there is hardly any juice. I've used pears, apples, dry dates, and an orange. Is it the choice of fruit? Nicole, I'm surprised the pear hasn't released a fair bit . . . . I'd add a touch of water at this point, giving it a good stir, to help it along. Also, once you cook it at the very end, more juice should be released. Having a lot of liquid isn't really a problem, though it will result in something that looks a lot like a chutney, i.e., quite chunky. If you want to use this mostarda on sandwiches (always a great idea - especially grilled cheese and meat/cheese sandwiches grilled on a panini press) and it seems too chunky, just use a sharp knife to cut the bits down to size. I'd probably add a touch of extra vinegar at that point, too, but that's just my preference for a lot of tart notes in fruit condiments. Do you add spices, ginger, and candied peel every time you reduce the syrup or just the first time? Delightful approach--just a little attention spaced over a few days, plus putting those bits and pieces to tasty use. Thanks for Oaktown Spice resource: we like their za'atar. Excellent job AJ! I've seen some recipes which call for mustard oil but the USDA frowns on its use in food. I'll have to try your version.